Cheapest and best quality are MSD. 20.00 bucks w/shipping and you get like 16 of them. One question though, what do you use to crimp them? I used a traditional wire cutter/crimper and ruined a couple. Hmmn, those don't come with wires...but they're still cheaply priced. Do you have to crimp them? Maybe just solder? I guess you crimp them first then put a little bit of solder on it. i just want to know what you use to crimp such a small pin. From the picture(I haven't done this), I would fold down those two little tabs to secure the wire in place, and then solder on top of the wire. You can "fill it in", so to speak... There's two little "wall" looking things along each side, i'd just fill the whole thing with solder. Our cars use Bosch style injector clips. Almost every car in the salvage yard has them. It is better to replace with quick release type clips than are used on newer model years. Otherwise, you will have to pull the little "U" shaped clip out to remove them. The first step is to disconnect and strip back the tape on your old injector clips. You will see that these clips on my car are not the origional. They were replaced several yeras ago, but I decided to use a better type of connector. I got the new ones at Top End Performance (www.racetep.com for $26), they are the style that you push on the ratianer clip to remove, not the stock style where you have to remove the retainer clip, which then gets lost. See the link at the bottom of this page for a part # and picture. You must do the leads one at a time, being careful to keep the polarity correct. If you get the polarity wrong, the injector will not work. It is a VERY good idea to double check that the ignition is off, the ECU supplies a constant +12 volts to the injectors while not in use (the ECU fires the injectors by grounding them). You don't want to chance blowing the ECU driver circut. Cut the lead as close to the end as possible. Next step is to solder the wire. Be sure to get good penetration, a cold solder joint is a real bummer to troubleshoot! A propper solder bond is only accheived by heating the work, NOT the solder. You want apply the heat of the iron to the copper wire till the wire itself is hot enough to melt the solder, otherwise you'll end up with a cold solder joint. Cold joints often don't conduct at all! Be sure to apply enough solder to the wire that you see it wick deeply into the insulation, this gives the joint additional strain relif. It will be the strongest point in the wire. When I bond the wires together, I spiral twist them around each other, this keeps them from moving while I solder, and makes a VERY strong joint. As you can see. it is also low profile so putting the shrik wrap over the joint is easy. After you solder the joint you slip on the shrink wrap tubing. This stuff is found at most any electrical parts store like radio-shack, and even Home Depot. It's fairly cheap and does a REALY nice looking job. It also ensures you dont' get any moisture in the joint. You can see the left one has been shrunk, and the right is ready to be shrunk. I carefuly use the tip of my iron to shrink it, but a heat gun is recomended. I have also used a lighter in a pinch, but not realy a good idea around the fuel system like this. Here I've shrunk the tubing, but now I have put on about 3" of black tape around one of the joints. WHY? because I once had a joint in my stereo system rub against the neighboring joint, after about 1 year it broke though the insulation and shorted out the system. I blew fuses and couldn't find the short for about 6 hours. I was PISSED ! Turns out the shrink tubing isn't as durable as tape. Now whenever I put 2 shrink joints next to each other like this, I tape one for added reliability and piece of mind. This may also save your ECU some day. Here is the finnisehd product. I spiral wraped the new leads starting at the connector and working twards the harness. You want to be sure the tape is overlaping so you get ateast 2 layers thick of tape the entire length. You want to tape it all the way past where you cut off the factory tape, and then wrap back over the joint several times. I am a bit overboard when it comes to little details, but tape is cheap and it looks as good or better than the stock harness did. if you are in a wet climate, you probalby want to put some calking or glue in the back of the connector to keep out condensation. I use silicone gel. The connector is water proof on the inside, but not at the back for some reason. 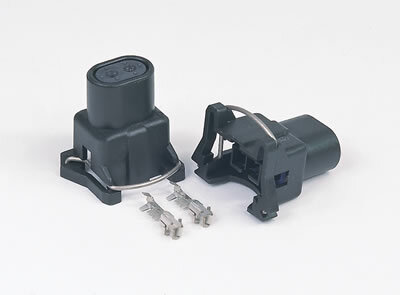 The AC Delco PT-425 and the GM 1211652 (same part) are the really good ones. They come already wired and have a weather boot as well. But they do cost more money. About $15 each. Pictures of these are on my web site. Auto Zone sells GP Sorensen 800-9213 that are wired for about $4. They may have to be orderd thru a "HUB" store. They don't have the weather boot. You can find AC Delco part stores in the "Yellow Pages" or ask someone at a auto parts store WHO sells AC Delco parts in your area. You can order them at any GM dealer but you will pay more money for them. The NAPA part is pretty expensive and is the same as the GP Sorensen part with shorter wires. Not a very good buy. When it comes to crimping electrical connections you really can't crimp with a pair of pliers. You need some sort of tool to apply TREMENDOUS pressure to the crimp area to get the copper wires and the connector to actually "flow" together. You can buy crimping tools at any Home Box or hardware store. If you notice, -the crimping jaws are very close to the fulcrum in the pliers where you can get that tremendous pressure. I recommend crimping AND soldering the connection. If you can't solder then dip the wire in dielectric grease b4 you crimp the connection to keep moisture out of the joint. Try to get connectors with weather boots and use wire that will just barely pass thru the boot in order to get a good seal. When you assemble the connector apply a little silicone dielectric grease to the wire so it seals that boot also. Always use silicone dielectric on the connector tabs themselves for the final environmental seal. The connector terminals in any of the connectors I have seen so far are very poor and do not provide a great amount of contact force which explains some of the problems people have with them. I don't know what company initially designed the connector, maybe Bosch, but if it was I expect better of them. Somebody should have made better ones but that requires an investment in tooling and R&D that nobody wants to do. These connectors were designed for OEM's that had no interest in making a connection that would last any longer than the warranty. A decent crimper will have a couple options on it. One of them is concave on one side and has a protrusion on the other. That option is for connections into a round receptacle without insulation(no plastic, just bare metal) It will "stake" it so to speak. If you use this option on an insulated piece be sure not to penetrate through the insulator or you may get rust/corrosion. The other option you are looking for is concave on both sides to squeeze the piece together. This is often used incorrectly on round receptacles and the wire can usually be pulled out without much effort. This is the one you want to use on this type of connector. There are other types of crimpers available but I'm sure you don't want to pay that much money for them. The tabs on the end are usually wrapped around the insulation just beyond the stripped portion and the same double concave crimp should be used. Do not strip more than enough wire needed to be crimped. Doing so may make it difficult to plug it in because of interference. I hope that was useful. I work with this stuff all day. WHAT HAPPENS IF THE CLIPS ARE REVERSED? ok i am pissed. my f'ing connectors (Bosch 85850) wont clip on all the way. I'll get another Quest, some day. I'm not familiar with that clip number and I have never seen it before on the list. But the weather seal inside the connector might be "outta-shape" or you may not be pushing on it hard enough. What do you mean, Have a pic :? Primary Fuel Injector Wires: Yellow/White and Yellow/Black. Secondary Fuel Injector Wires: Yellow/Green and Yellow/Blue. The Yellow/White wire from the Primary Fuel Injector goes to a resistor. The Yellow/Black wire from the Primary Fuel Injector goes to no. 60 pin at the ECU. The Yellow/Green wire from the Secondary Fuel Injector goes to the same resistor that the Yellow/White wire from the Primary Fuel Injector does. The Yellow/Blue wire from the Secondary Fuel Injector goes to no. 62 pin at the ECU. Hope this helps you in installing new Fuel Injector Clips.